Home › Market News › Research & Analysis › 2019 what lies ahead? The sharp drop across the yield curve in the last month shows a repricing of short-term expectations of the path of US interest rates in 2019. The Federal Reserve has stressed it will remain “patient” and data dependent which investors have interpreted as pausing on its previous guidance of two rate hikes over 2019. During December investors rightly concluded that the hike to Federal funds and “autopilot” balance sheet reduction amounted to the central bank applying brakes to the economy. “Quantitative tightening” (“QT”) ($50bn of asset sales per month) has the potential to increase yields. For the moment worries about QT have abated, but this is a moving part for 2019.
b) Strong US economy as evidenced by payroll data and wage growth (+3.2%). The December data (+312k v 184k) with November and December revised up by 58k helped dispel worries about a sharp US slowdown in 2019.
c) Improving sentiment around the ongoing US/ China trade talks (7th-9th January) has featured in the January optimism with the negotiations being given a 90 day breathing space after the recent escalation. The Chinese leadership has prudently prepared the public for a protracted negotiation which if relieved early could provide a boost. d) Low valuations, low expectations. 2019 has an advantage over 2018 in this respect. More on this later. a) Global equities were expensive at the start of 2018 and spent 8 months repricing. 2018 demonstrated the length and pace of a repricing phase at least insofar as MSCI World ex US ( 8 months/ with UK/ EU index losses (UK)-12% (Eurostoxx 50)-14% below Tokyo -15% and Shanghai (-21.6%). US markets again outperformed with a -6% return. b) The FAANG (Facebook, Apple, Amazon, Netflix, Google) bubble? Yes and No. Apple Inc where concerns over iPhone pricing/ volume growth proved justified. Apple’s annual return of -10.7% puts into context the market cap reduction of c. $405bn from its peak of $1.1trn. Microsoft was up 19.2% over 2018, Google up 2.5%. Overall the FAANGs proved resilient to 2018.
c) Weak crude oil – recent promises of 1.2m barrels/ day production cuts failed to move crude oil, the glut in crude is a continuing issue in 2019.
d) Rising global interest rates – markets were sensitive to US rate hikes with a major byproduct, the flat yield curve impacting banking margins. 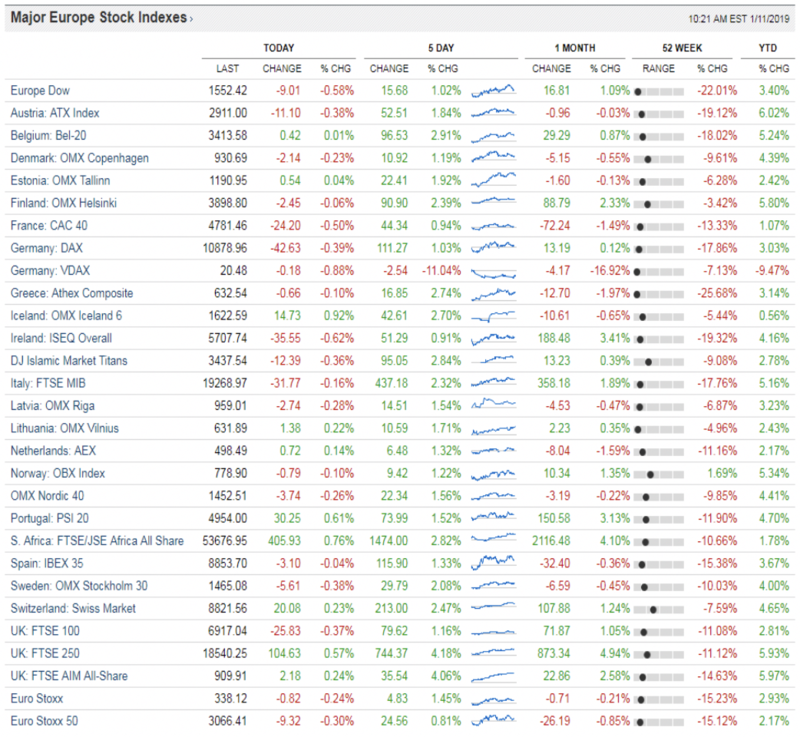 How correlated are UK/EU equities? The magnitude of the drop in UK/ EU valuations over 2018 is relatively uniform with high downside correlation across all indices. The data suggests that the 2018 UK/EU index declines did not vary much due to special factors for example Brexit and the Paris protests over December. Whilst predictions are more likely to be wrong than right! We think valuations and expectations have started 2019 low (UK-350 P/E of 12x). We think positive UK100 returns are likely c. 10% to 7,400. 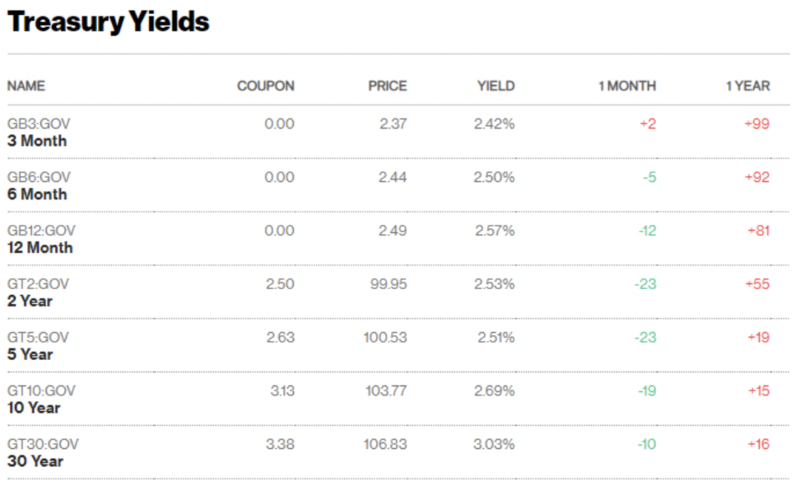 Global bond yield curves likely to continue to flatten, we expect no rate increases from the US Fed, the ECB or the Bank of England over 2019. We do expect continued QT from the US Federal Reserve and further withdrawal of stimulus by the ECB. Having survived a tough 2018 in good form, our expectation is for strong returns from US technology stocks in 2019. After limping out a tough 2018 with weak volumes and pricing increasingly under pressure, we expect UK property to have a tough 2019. Oil/ oil services we are bearish on the grounds that the US will continue to pressure OPEC (Organization of Petroleum Exporting Countries) to keep prices low which threatens OPEC management. We are positive on paper and packaging suppliers into FMCG (fast moving consumer goods) sectors as online volumes are rising alongside increasing consumer environmental awareness. Investors want more exposure to developing technologies, artificial intelligence, robotics and data/ algorithm based businesses. 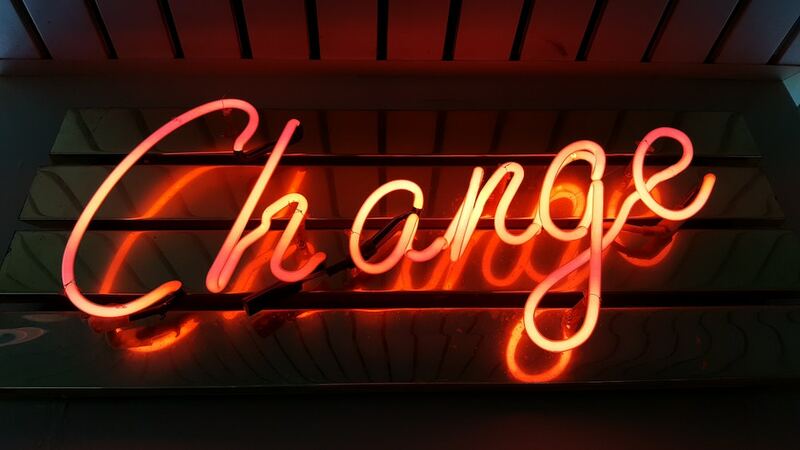 Banks face the positive impact of digitization, recent restructuring gains and the end of payment protection insurance (29th August 2019) having started 2019 inexpensive. The downside risk is lower margins and the online competitive threat.